Hello members, new guy here looking for some help. Last night, my 87 supra died on me in a parking lot. It cranked but did not start. Checked engine, fuse boxes but didn't see anything so had it towed home. In the morning, I was able to start it on the second crank but idled at very low rpms - around 500. Glad that I was able to drive it a little and at least park it inside my garage to work on it. After reading & searching on this forum about similar issues, I decided to inspect the CPS per TSRM. And it turns out that I was not getting any resistance on G1 pickup coil. G2 and NE pickup coils both look good showing 161 ohms each. TSRM indicates to replace CPS if "resistance is not within specification". I didn't have any luck searching to see if I can purchase the pickup coils separately. Rockauto has a CPS Cardone return/rebuild service for just over $200. Driftmotion has the "Digital CPS V2 Upgrade for 7M-GTE" available for $300, which I'm considering but haven't researched yet how involved this conversion will be. Searching the SF forum, I did not find a post regarding replacing the pickup coils. Has anyone here replaced the pickup coils in their CPS? Any experience/feedback on the Rockauto or other vendors? My intended goal for this 87 Turbo is just a cruising/daily driver car and occasional long drive. Basically, keeping it stock with maybe some mild suspension and wheel/tire mods in the future. Thanks in advance. Edit: I just read on Driftmotion's website that their Digital CPS V2 Upgrade for 7M-GTE does not work with a stock ecu, so that's not an option anymore. Last edited by OldBonus; 04-06-2019 at 06:38 PM. I have the remain A1 Cardone CPS unit from RockAuto. The first remain CPS unit I had received had damaged wires inside the unit causing it to short out to the metal housing after 50 miles but the 2nd unit I received did not have that problem plus I also added another layer of insulation around the wires inside the unit. I would personally avoid that DM digital cps upgrade since I have heard of 2 failures plus those hall effect sensors do not like extreme heat from the exhaust manifold and like you stated it will not work with the stock ECU. I would just go with the A1 remain unit and enjoy piece of mind that you have a lifetime warranty if you need to send it back in but it is always good to keep a spare CPS on hand too. The remain unit I received did have 2 new green pickup coils so if you can source those you might be able to rebuild it yourself. Thanks for the response! It's good to know that the CPS unit from RockAuto works well. Before I place an order, I'll spend a little more time looking for pickup coils because my preference is to do a rebuild. My current CPS is in pretty good condition and doesn't have any oil leaks. By the way, how long did you wait for the CPS to get rebuilt and shipped back to you? No problem. When I ordered it from RockAuto they had them in stock so I did not have to wait to receive it but they changed it to a rebuild service shortly after I ordered mine (Probably because I did not send my working core in for a $32 credit after shipping lol). You can also check your local Napa, AutoZone or auto parts stores and they might have them in stock since RockAuto is a different supplier. Yeah, I'll check with Napa and other local stores. I'm also planning to get used cps for a spare, just in case. Hopefully, the rebuilt cps will fix my problem. Have you tried to gently wiggle the wires on the unit? Brittle wires seems to be the most common problem with the CPS unit. The wires inside the CPS up to the harness connection are really stiff, but I'll go ahead and wiggle them around (gently) and see if my readings change. The fact that G1 is dead may not be the source of your problem. The ECU can run just fine with only G2, it will just take a little longer to synch up. I would check for cracked wiring and flaky connections. I went ahead and wiggled the wires inside the CPS unit as well as the external wires up to the connector. And still showed G1 as an infinity reading. I even stuck a needle to wire just outside the G1 pickup coil and still no measured resistance. Although the wires are stiff, I didn't see any flaking or cracking. And the terminals inside both CPS & harness connectors look straight and shiny with no signs of corrosion. By the way, this car has 125k miles on it. Is this why I was able to start it after the car sat overnight? Can you please explain what it means with the ECU taking a little longer to synch up? (Do I need to crank the engine longer before it starts?) Thanks. The ECU has no idea where the crank is until it receives either G1 or G2. At that point it knows its BTDC 10deg on cyl #1 or #6 depending on which G signal it is. 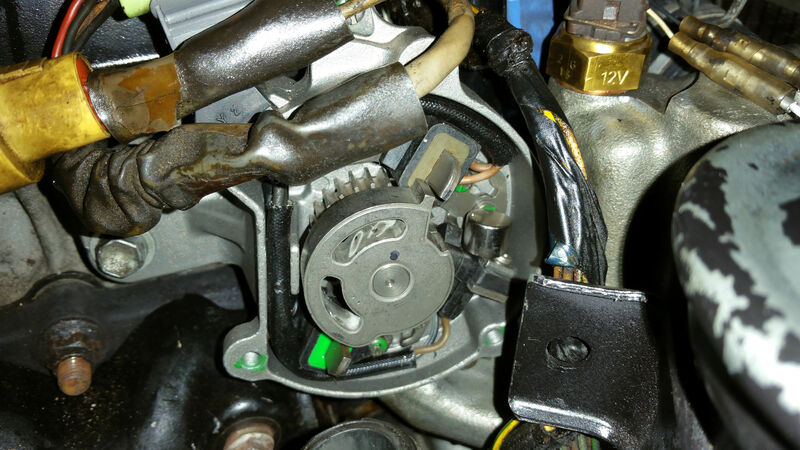 It then synchs the crank sector register that tracks engine rotation for the rest of the drive cycle and begins to fire the ignition and pulse the injectors. Normally the longest rotation of the crank before this synch happens is 360 degrees (average of 180 degrees). With only one G signal, it could be up to 720 degrees before it synchs, and on average 360 degrees. The engine usually fires & runs on the first crank but during the past week, it's been taking a few tries before it starts to run. This engine runs great (smooth, quiet, no misfires) so I didn't pay much attention to the extra cranking. edit: The car is running at the moment but still has low rpms (500 rpm). No luck trying to get a local parts store to get a rebuilt CPS so I'll be placing an order to Rockauto next week or so. In the meantime, I'll be checking ISCV, IC piping, hoses (again) and maybe cold start injector to see what's causing low idle. I think I remember seeing a post about coolant temp switch affecting idle as well so I'll unscrew that and inspect. Last edited by OldBonus; 04-09-2019 at 01:24 PM. Troll eBay. That is where I have bought my last 2 CPS. Thanks, I'll give it a go. I've also been looking at offer-up in my area, I was surprised to see quite a few Supra Mk3 stuff for sale. Unfortunately, a CPS seems to get sold quickly.